Bottomline: The HTC Desire EYE is not an extraordinary smartphone, yet it’s a selfie-lover’s dream. With the flagship level performance, water resistant and pretty design, it is an outstanding phone. Selfies are getting popular by the day and this is encouraging manufacturers to produce smartphones with high-resolution front cameras. HTC also joins the battle and brings the incredible 13 MP front camera in its Desire Eye to attract consumers looking for an ultimate device for selfies. 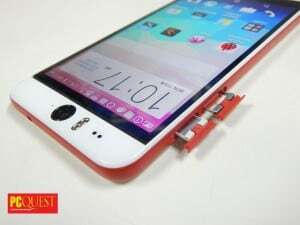 It also comes loaded with other features including the polycarbonate body which is waterproof up to 1 meter 30 minutes. Let’s find out more in this review. The polycarbonate body gets a fresh and funky look, feels premium but shows up greasy finger marks. The design looks similar to Desire 816, yet the red ribbon (blue variant also available) across the sides enhances the beauty of the device. At the right side, it boasts the power, volume rocker, and dedicated camera buttons which feel flimsy. The buttons don’t feel tangible as we had to check whether the desired effect happened or not. On the left side, the nano-SIM and microSD trays are placed which feel more solid and easy to access. The 5.2-inch display is bright, vibrant, has impressive color reproduction, protected by Corning Gorilla Glass 3. The 1080p resolution screen is crisp and clear to use for browsing or reading an eBook. The IPS display is bright enough to use outdoors on sunny days. It also has good viewing angles that allow you to share the screen with friends and family while watching videos. HTC kept the known Boomsound speakers on the Desire EYE, which is cleverly hidden just above and below the screen. The speakers are solid in terms of loudness and deliver crispy sound. 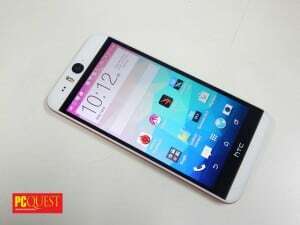 The Desire EYE is equipped with the Qualcomm Snapdragon 801 processor that clocks at 2.8 GHz, 2GB RAM, 16 GB internal memory, expandable up to 128 GB and runs on Android KitKat 4.4.4 with HTC Sense 6 layered over it. The EYE runs smoothly and performs almost every task that you can expect from a flagship smartphone. Playing games like Fifa and Asphalt 8 on the device was a pleasure. We didn’t notice any lag while playing the game and even during switching between apps and games. HTC’s Sense Android interface is crisp and intrusive. 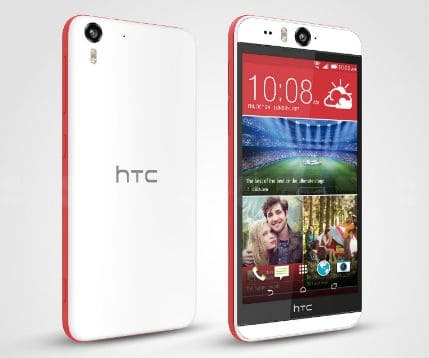 HTC Desire EYE has 4G connectivity, GPS, Bluetooth 4.0 and dual-band Wi-Fi – but not the fastest 802.11ac standard. It comes with the usual sensors, such as accelerometer, gyroscope, and compass. It only misses a few things as compared to its premium sibling i.e., an infrared blaster, so you can’t use the EYE as a remote, and there’s no barometer for tracking elevation in fitness apps. 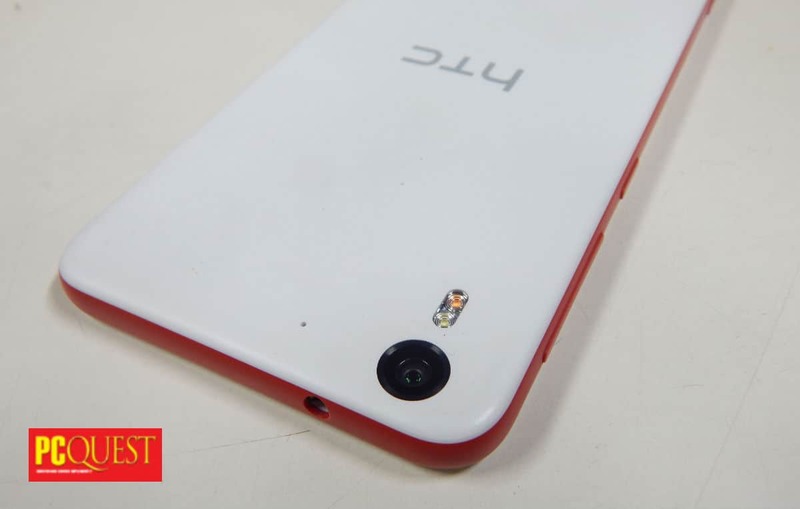 With both front and rear 13 MP camera, the Desire EYE is the right smartphone for selfie lovers. The lens on the front camera is shallower – 22mm as opposed to the 28mm, which is a sensible choice, as it provides a wider angle so you can get more of your mates into a shot for a nice groufie. At the both sides, HTC equipped dual-LED flash to light up faces in darker conditions. The flash makes a big difference, as it is something we rarely see on a phone. The dual-LED doesn’t work quite well, as the light is whiter that make faces looking a little washed out, yet the image has no noise or murk under the dark conditions. Both cameras are capable of clicking decent images without using the flash. The rear camera produces vibrant colors with all the shots, especially we liked the close-up shots where colors were vibrant and the autumn leaves brim with detail. It has lots of camera feature in which split-screen shooting is fun, and other interesting features are face-merge option and a ‘make-up’ effect. The EYE has Li-Ion 2400 mAh battery that last for about one day and in our battery test it lasted for 7 hours 20 minutes. The call quality of the phone is solid. 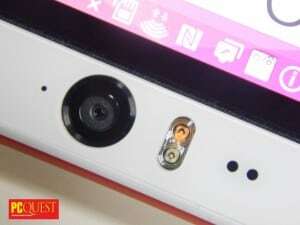 The loudspeakers help you to clearly listen the voice, also it has the noise-cancelling mic on the back of the phone.